Savannah Sunrise, a popular slots game from Cryptologic, has five reels. There are no pay lines here; this game follows a new format with a distinct payout structure and plenty of chances to win. The lack of pay lines has not put slots fans off as far as Savannah Sunrise slots is concerned. In this game, there are with thirty eight possible winning sets. This game format is simpler than that of regular slot games with reels and pay lines, and it is easier to play, even for someone who is new to slots. 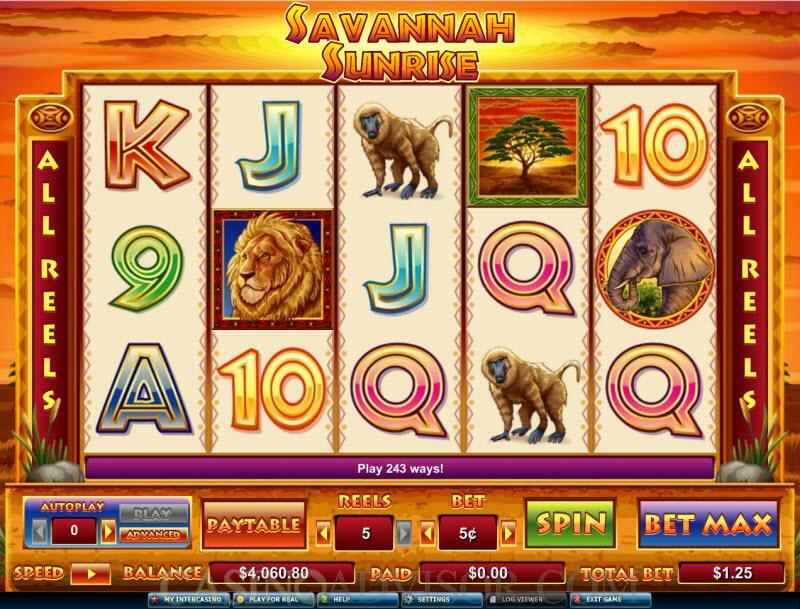 The Savannah Sunrise slot machine game was launched on July 31, 2009 and players are already beginning to appreciate the game experience offered with this slot game. 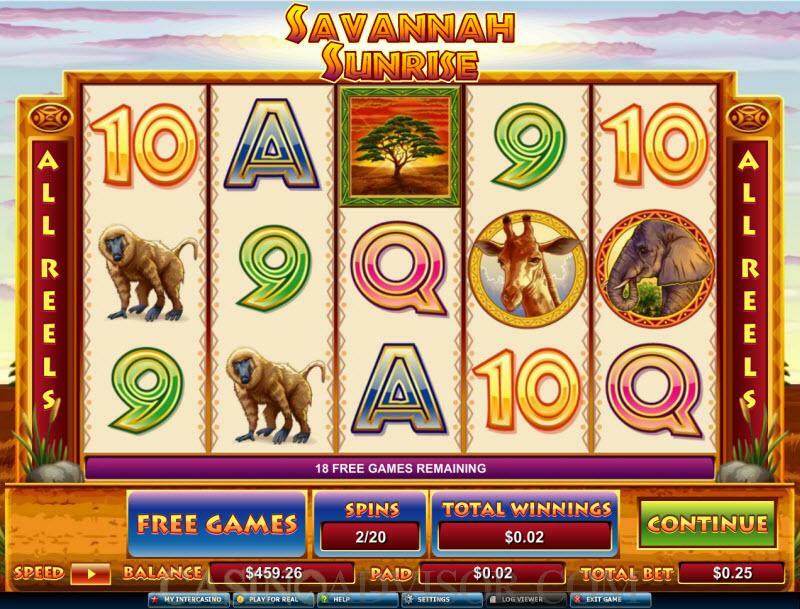 The Savannah Sunrise slot machine game is available for online play at casinos like Intercasino, but U.S players are not allowed to open accounts here. The theme, as the name indicates is an African safari on the wild savannah, where the lion roams free and only the fittest survive. 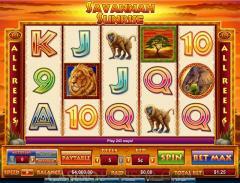 The effect of the Savannah Sunrise theme is enhanced by the symbols used in the game - the Lion, the wild symbol, which appears only on reels two and four; the Tree scatter symbol which activates the free spins bonus feature; and other symbols that can prove to be lucrative as well as visually appealing. 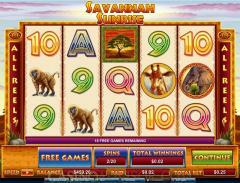 Savannah Sunrise features a free spin bonus round, where rewarding multipliers up to fifteen times apply. With these multipliers, a player earning the big jackpot of 500 coins could earn as much as 75,000 coins. A player gets to take advantage of the free spin bonus feature in Savannah Sunrise slots when he or she gets a minimum of three Tree scatter symbols on the reels. You can also win additional free spins during the free spins bonus round. And when you get the wild Lion icon as well, your rewards are multiplied considerably - up to fifteen times. The Lion wild symbol has to appear on both the second and fourth reels in order to get the fifteen times multiplier, but it has profitable results even when it appears only on one of these reels. A Lion icon that comes up on the second reel will multiply rewards by three, and when it comes up on the fourth reel, rewards are multiplied by five. So the Lion symbol plays an important role in increasing your winnings. Interested in reading more detailed information about Savannah Sunrise? If so Click Here for more details.